B.Sc(Biotechnology) from Holkar Science College, Indore. 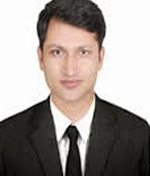 OP Jindal University, Raigarh (C.G), Working as a Assistant Professor from July 2017 to till date. Employees’ intention to quit in retailing. Gender pay-gap, workforce diversity, employees’ discrimination. Pandey P., Singh S. & Pathak P. (2017), Factors affecting turnover intention among frontend employees in the Indian retail industry. International journal of Human resource development and management. (In production). Pandey, P., Singh, S. and Pathak, P. (2016) Devising retention strategy for front-end employees in retail: an application of analytic hierarchy process. International Journal of Services, Economics and Management, 7(2-4), pp.222-245. Pandey, P., Singh, S. and Pathak, P., 2016, March. Achieving retention through human resource information system: Developing a framework. In Recent Advances in Information Technology (RAIT), 2016 3rd International Conference on (pp. 700-704). IEEE. Pandey P., Singh S. & Pathak P. (2015), Ethical leadership: The need for a new approach in retail. Purushartha, Vol.3 No.1: 414:422. Pandey P. and Yadav R. (2018), “Bakeys Cutlery: An Innovative Sustainable Product”, Ivey Case Publishing. Digital India or Digital Divide? Identifying The Barriers and Enablers of Shopping Online Among Persons with Disabilities in India. Paper presented at 5th PAN IIM Conference, Lucknow, 14th – 16th December, 2017. Retaining service employees: An application of Analytic Hierarchy Process in the Retail Industry. Presented at Fore International HR and OB conference 2016. 24th-25th November 2016. Achieving retention through human resource information system: Developing a framework. Presented at International Seminar on Recent advances in information technology (RAIT, 2016) Indian School of Mines, Dhanbad, 3rd -5th March 2016. Proceedings- IEEE Xplore. E-tailing in India- a comparative study of the business models of national and international e-retailers in India. Presented at 7th Oxford Asia Retail Conference Singapore 24th – 26th September 2013. Human resource management and ethical issues in retailing. Presented at National Seminar on Effectiveness, ethics and sustainability- the measure of organizational excellences (NSEES), IIT(ISM),Dhanbad, 6th -7th December, 2013. Retail leadership: A need for a new approach in retail. Presented at National Seminar on Effectiveness, ethics and sustainability- the measure of organizational excellences, organised by National HRD Network (NHRDN). Winner- Women’s Doubles Open University Badminton Tournament, O.P. Jindal University, Raigarh, November, 2017. Runner up- Women’s Singles Open University Badminton Tournament, O.P. Jindal University, Raigarh, November, 2017. Selected among top 30 Indian delegates for World Governance expedition UK, 2017 organized by VisionIndia Foundation. Gold medal- women’s 800m race, IIT (ISM) Annual Sports Meet- 2017. Silver medal- women’s 8km fast cycling race, IIT (ISM) Annual Sports Meet- 2017. Selected as a Gender Champion of IIT(ISM), Dhanbad, 2015-Present. Awarded 2nd position in the speech competition Sulabh International for Action Sociology Bihar, Patna -2015. Gold medal- table tennis tournament, BIMTECH, 2012. Runner up- All India Mahatma Hansraj Aryan Tournament (Badminton) 2000. Winner- All India Mahatma Hansraj Aryan Tournament (Badminton) 2002-03. Was selected as one of the top 100 performers for Business English Certificate vantage level exams for the North Region. Executive member- Karmajyoti (Center for Societal Mission), IIT(ISM) Dhanbad, 2015- 2017. Volunteered caring soul foundation in Mass Awareness Campaign Against Cancer/Aids.